A warning has been put into place by the Met Office this weekend as winds ‘increase expected impacts to medium’ - with the office saying the worst conditions will be during this afternoon (Saturday). The warning on the MET Office website said southwesterly severe gales will affect much of northern England, north Wales, Northern Ireland, southern and central Scotland at times during Saturday and overnight into Sunday. “Here gusts to around 70 mph are possible even at lower levels, with hills seeing even higher gusts. 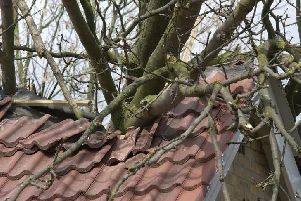 The office warned of likelihood of travel disruption on roads with winds capable of bringing down trees and causing damage to buildings. The MET office’s Chief forecaster said: “By Saturday a very strong west to southwest airstream is expected to be in place across much of the UK, but will be particularly strong along, and to the south of, the trailing frontal zone. A wave running along this zone seems likely to supply a further “squeeze” in the Saturday afternoon/ evening period, and it is the extent of this “squeeze” which remains somewhat uncertain - enough perhaps to boost gusts by 10 mph or so. A period of heavy rain will also affect much of the area. Trees blocking roads have already been reported, with Louth Police (@LouthPolice) tweeting out a picture of the first one they have come across. Have you seen any trees down? Any problems on the roads to report due to the bad weather? Email daniel.jaines@jpress.co.uk, Tweet us or post on our Facebook.